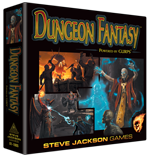 We've discussed designing characters for the Dungeon Fantasy Roleplaying Game. Now, how about creating dungeons? That's a lot of work for the GM – so it should be fun to do, with fun results. Dungeon Design (Exploits, pp. 80-85) is an excellent starting place. Here are more tips; page numbers refer to Exploits. Concept. Archetype (pp. 80-81) is only a start. So it's a mine – but why is it an adventure? Are the main enemies the miners, or what they disturbed? What was being mined? Are there "natural" dangers, like titanic burrowing worms? "A demonic lord of subterranean monsters has occupied the dwarven iron mines, and the dwarves will forge arms and armor for those who defeat it," differs from, "The baroness has a one-pound silver bar for each delver who helps shut down orcish mines on her land (in reality, a lich is using orcs to excavate a trap-filled lair)." Such decisions suggest appropriate monsters, traps, and treasures. Moments of awesome. Dream up some "set pieces" that make the adventure cool. The only limitation is that they fit your concept. Consider that mine: How about an icy underground river full of vicious fishes, a rock-eating worm busting out of a wall to ambush the heroes, and a barracks full of orcs or demon-worshippers, which includes a cursed, bloodstained altar? These usually qualify as Special Features (pp. 83-84) and/or Set Encounters (p. 85). Rough map. Create this in an easily edited format. Place dungeon entrances and exits, settings for your moments of awesome, and battlefields for "boss fights" (as with the demon or lich). Then connect these however you like – buttressed galleries hewn by miners, rough tunnels chewed by monsters, smooth chambers created by the resident magic-user, etc. See Maps (pp. 81-82) for important details. Set encounters. You've chosen monsters for your moments of awesome, but what else lurks here? Pick enemies that make sense – no huge dragons behind man-sized doors, water elementals in lava pits, or mundane humanoids where there's tainted air and no food. Reward stealth and reconnaissance by distributing encounters so it's possible to avoid bringing the whole dungeon swarming in. Edit the map as needed; for instance, orcs eat, drink, and sleep, so add barracks and larders, plus wells and air shafts for sneaky delvers to exploit. Wandering monsters. As Wandering Monsters (p. 85) explains, set the odds of random encounters, the frequency of checks, and what appears when the dice spell trouble. A table is best for that last part – if only "Roll 1d: 1-3, orcs; 4-5, zombie orcs; 6, earth elementals." All monsters should fit the concept, and some might have ties to set encounters. Odds, frequency, and table can vary by area (more cultists near the barracks, more dwarven undead in the galleries) and the delvers' actions (like quickly silencing sentries – or not). Order of battle. Be ready to adjust minor encounters to the party's strength. Major ones can be static – especially if the heroes will be forewarned. Adjust the map to create suitable spaces for the battles. For instance, if the party is tough enough to face 50 orcs, you'll need rooms large enough for the clash; likewise, attacks by 100-foot-long worms demand 100-foot-long tunnels. Battlefields often include dramatic obstacles (p. 83); mark those as well. Treasure! Define major treasures – artifacts, coins in hidden vaults, scrolls in the lich's library, etc. – and find or make places for them on the map. Do the same for incidental valuables, like silver chipped from the mine's walls, and set a maximum value. Anything the monsters have may become plunder, so equip foes only with things you want the heroes to have. Note the skill rolls needed to find and identify loot; see Looting (pp. 24-25) and all of Chapter 5. Final map. By now, you've edited the map and noted locations for everything. Review the "big picture" and secure valuables and secrets with doors and locks (pp. 82-83), nasty surprises like traps (p. 83), and hidden entrances (p. 85). Don't go crazy with this, or the game will slow to a crawl while delvers poke at every stone. In areas the dungeon's denizens traverse regularly, there should be either fewer security measures or ways to circumvent them quickly: keys and hidden controls to find, magical passwords to overhear. Reward clever adventurers! Area information. Once you know all the stuff above, tidy up your notes and key them to the map. This need not be fancy. Just list each area's monsters, loot, traps, etc., along with reminders of why you put them there. Rumor control. Look at your dungeon and decide what rumors heroes might hear. 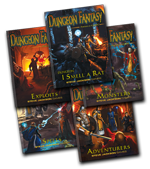 These could hint at concept, moments of awesome, denizens, treasures, or layout; for example, "We've sensed a powerful undead presence in the orc mines" is a clue about occupants (orcs and a lich), concept (machinations of a lich), and a major encounter (lich fight!). Partial maps are another possibility. Have bogus information for those who fail the rolls in Tavern Tales and Moldy Books (p. 15). Consider side-quests and secret missions – maybe the demon has cut off access to a secret vault, and dwarf PCs are tasked to rescue artifacts within. 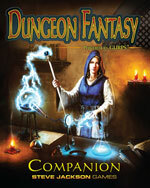 Finally, don't forget to check out the Dungeon Fantasy Companion for traps, treasures, and a sample dungeon to inspire you.